Sometime in late June, Rachel Carey, senior history major and data master, put the final touches on the 1910 federal census for Harrisburg. The completion of 1910 now allows us for the first time to see diachronic change in the city in terms of any number of categories: race, birthplace, occupation, property ownership, literacy, etc… (for an example of immigration, see this post). Between 1900 and 1910, in fact, the city grew from 50,167 to 64,305. Rachel has now turned to the 1920 federal census. 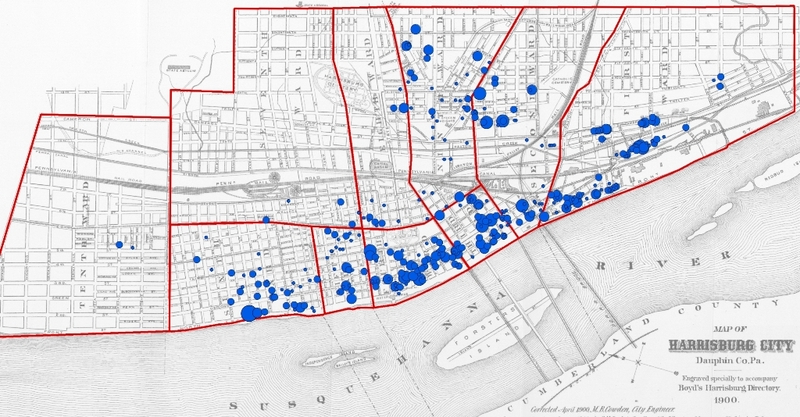 Completing this year will allow us to visualize the growth of Harrisburg’s historical neighborhoods. This will be especially valuable for seeing how individuals displaced during the destruction of the Old Eighth Ward found residence in other parts of the city. Dr. John Fea’s students in the course Pennsylvania History inputted church membership records last spring for Market Street Presbyterian Church in the year 1900. This was a bit of an experiment to see whether we could integrate a non-census field (religious affiliation) with federal census data. The results are promising–and I heard that they made for interesting discussion in his class. The image below shows the residences of the members of Market Street Pres in 1900. Most are located in the more affluent homes close to the river. Here are the same church members overlaying particular ethnic groups: Irish (green), Russian (red), and Greek (pink). Meanwhile, Dr. Jim LaGrand‘s class worked on normalizing and standardizing the industry and occupation fields from the 1900 census. The different census takers did not use standard categories, and we’re trying to bring some organization to this messy list. What we can say is that a signfiicant part of the population found employment with the railroad. This distribution map below shows anyone affiliated with the railroad for employment. The large black dots represent concentrations, but look at the smaller dots scattered across the entire city. The 1910 federal census added the category “Industry” to supplement “Occupation”. We are trying to retroactively turn a generic occupation category in 1900 into separate Industry and Occupation categories. We’ve made some progress on inputting property values for 1900. And this is now a top priority for the rest of the summer. Graduating history major David Crout worked last spring to add property values listed in the annual tax assessments for Harrisburg in 1900. We used the Eighth Ward as a test case. The lightest color (pale yellow) indicates mostly tenant properties for which we do not yet have property values. The property values for these should be listed in the tax registers for freeholders living in other wards. The blue background layer indicates other buildings for which no values exist at all—these are null values. Some of these are clearly not residences, others are the results of problems in data entry. We would like to have property values for the entire city in 1900 completed by late fall. History student James Mueller is working this summer to standardize street names. Using historical banks of street names–the federal censuses of 1900, 1910, and 1920; the Sanborn maps of 1905 and 1929; the city directories, etc..—James is creating a list of normalized street names. This is absolutely important for creating the unique identification that links all our data sets together. Professor Albert Sarvis and I are showcasing the project this week at the Keystone Digital Humanities in Philadelphia. Looking forward to a round of feedback.